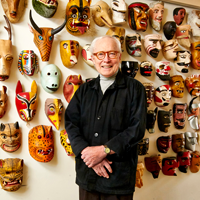 The Mask Man’s real name is Bob Ibold, a retired graphic designer from Lancaster, PA, USA. I started collecting masks in the 1980’s. As a person who loved painting and sculpture, my attraction to masks was purely aesthetic at first. I saw them as wonderful examples of art. After my collection grew, I became more interested in how they were used, what they represented, their history, and other stories that surround them. Now I enjoy both the art and the ethnography. The masks you see on this site came from estate sales, internet auctions, flea markets, etc. Some were in Masks from Around the World, a show at the Lancaster Museum of Art held in 2002, which was the same year I retired from the advertising business. The show was such a success that I decided to start MasksoftheWorld.com. Since then the website has grown considerably and now consists of the following. Blog & Ask the Mask Man are the popular Mystery Mask blog where people get help with identifying a strange mask they acquired… for free. It is also an opportunity for mask collectors to exchange ideas and help beginners. Appraisals & Buying are other services we offer for individual masks or entire collections.